It is a moment of great pride to remember and acknowledge the overwhelming work done by Shri. Kesaribhau Patil and Smt. Sunita Patil. The pioneering founders of Kesari Tours, they established the Kesari Art and Culture Foundation seven years ago as a profound expression of deep commitment to society and also to inculcate artistic values. The organisation provides aid to various social institutions, non-governmental organisations and service establishments. As per the tradition, Kesari honours the extraordinary people by honouring them with the Kesari Gaurav Sanman award. 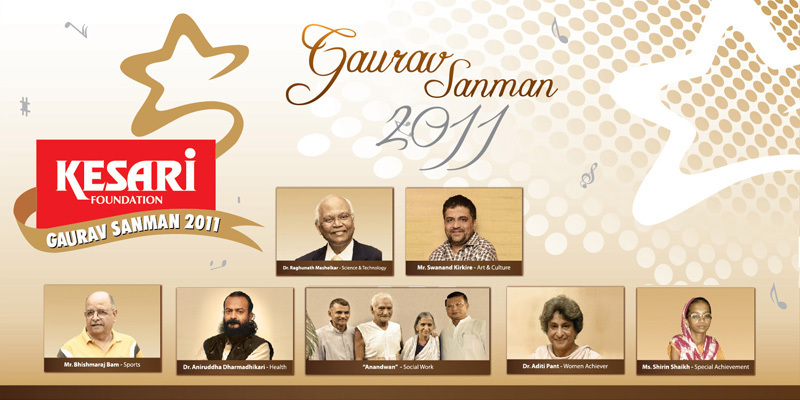 The Kesari Gaurav Sanman award ceremony is taking place on December 17th, 2011 at Nashik. This will be followed by a fusion musical recital by A.Shivmani, Louiz Banks, Vijay Ghate, Ravi Chary and Sniti Mishra. Kesari Tours foundation, for the first time acknowledges and salutes a social service organisation conferring the honor on Anandwan and Lokbiradari, founded by the legendary figure, Baba Amte. It is indeed a tribute to the significant contribution made by the Late Baba Amte and the Late Mrs. Sadhanatai Amte. The event, Kesari Gaurav Sanman 2011 is taking place on December 17th, 2011 in Dadashaheb Gaikwad Auditorium in Nashik, Maharashtra. It starts at 1800 Hours. The ceremony felicitates six exceptional individuals from their respective fields for their commendable work.